We have not yet had our first day of homeschooling. 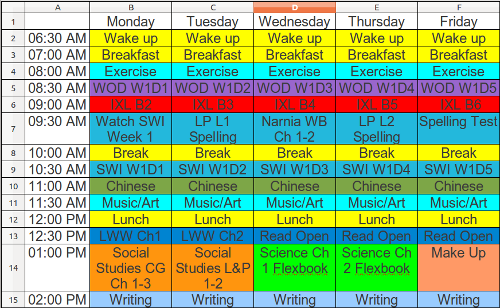 As this is my first year and I tend to be very analytical (Take off the ‘ytical’ is you must) I have spend hours planning out a schedule. I have enough work experience to understand that it probably won’t survive the first day. My plan is to monitor how much time it does take and what books work and adjust accordingly. I opened up each book looked at the table of content and flipped through the first couple of pages. I counted the number of lessons, days, weeks, chapters, or sections and made a spreadsheet. I figured out how many weeks of material each book was given how many day per week I was going to do it. I also guessed at how much time it was going to take each day. The time per day is the biggest question mark. From that I made up my first week schedule and then my daily plan. I remembered the analogy of putting rocks in a jar. You have to put the big rocks in first so you can fit the little rock around the big ones. If you put the little one in first, the big ones won’t fit. So Student Writing Intensive was the biggest so it went first. Words of Wisdom went next. It is very nicely laid out week by week, day by day. IXL Math and Foreign Language both just have one resource so they each got their own daily time slot. I then filled in some language art spots with vocabulary and spelling. I start social studies with Canadian Governments as I looks like I don’t have much material and I have project plans that require that knowledge. Science we are doing human anatomy. I am using material from CK-12.org as I wasn’t going to pay $80 for a book I hated. My background is heavy in the sciences. So the plan for out first day. Wake up a 6:30 am. That is my wake up time but I’ll have the kids up by 6:45. Breakfast starts at 7am. We also have to get my daughter who is continuing in the public system ready for the day. She has already indicated an interest in homeschooling next year. She will have the opportunity to choose again next year. 8 am is exercise. My son’s ADD medication takes 1/2 an hour to take effect and we have found that exercise first thing in the morning helps with his concentration. Daddy could also use the exercise. Bible is 8:30 am. Again we found that quiet prayer helps with concentration. Math and Student Writing Intensive are next. This when he is most likely to be most focused. I put the break in the middle of language arts as that is his toughest course. That may change I think it will help but I could be very wrong. We then have Foreign Language and music/art. After Lunch we will have quiet reading. Some of that will be assigned for his course work but mostly it will be his choice. We then have either Science or Social Studies. These are his favourites so I am putting them at the end of the day. The last item is writing. We wants to be a writer so this will be free writing. This is also the time that I will have to go get my daughter from school so he will have no distractions. My toddler and I will be out of the house. Now that I have a plan I am back to being confident and look forward to getting started. Now my wife just reading this post has pointed out that I only have a four day week and my daughter has a short day on Tuesday and the kids have Dentist appointments on Friday. I knew all of that. I made the dentist appointments. Guess I need to re-plan already. A homeschooling dad! How fantastic! 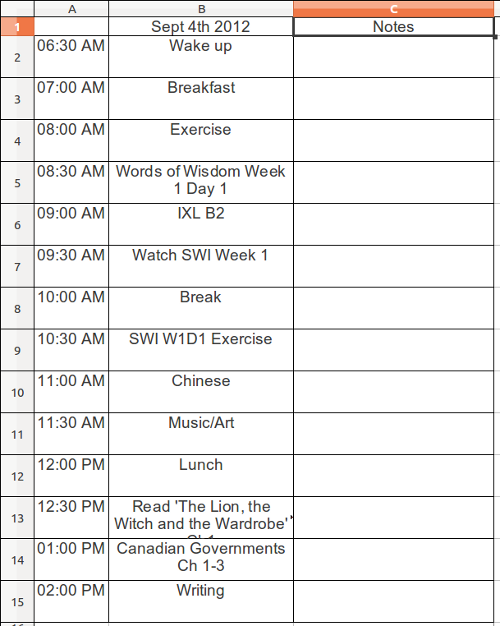 Great post, intimidating schedule. I hope you have a terrific year! Your plan looks great! I’ll be following with interest. I know that with my ADHD child math is always the biggest time question mark. Looks like you are a spreadsheet wiz! I’m slightly jealous. Hope your year is a great one. Looks like a thorough schedule for the upcoming year! Ha! I can really relate to your post. I have made spreadsheets, lists, etc. to figure out exactly when we’re going to do what. It can be a maddening process! I think it’s really pretty awesome that you’re a dad homeschooling. 🙂 You will find what you already said, that your schedule will change, books may need to be changed or expectations adjusted. Just go with it until you know what to expect from yourself and your son. You will find that with the SWI lessons that lesson 1 takes a while because he will be following along (and pausing as he goes to do what the “class” is doing) and the second day, the day he takes his keyword outline and turns it into sentences, may take a long time. After that the rough draft/dressups and final drafts all go fairly smoothly. I use SWI level A with my two sons, both of whom had severe writing disabilities. We really like it because it is broken down into pieces that are easy to understand, but the material is SO GOOD. I wish I’d learned writing this way when I was in school! I’m in love with your spreadsheets. That is all. So did you stick with this schedule? Longer answer- This was one of the first thing that went out the window. Keeping him on MY schedule was stressful for both of us. Were we ended up was weekly and term goals that he was largely responsible for how he got to. I still had to direct a little bit along the line of “You still have a lot of x to get through” but that has worked better particularly in this last term. We are almost finished our portfolio and we have 6 weeks left. LOL! I was curious if you were able to stick to a schedule. I have tried several times and it just hasn’t worked. I like the idea of weekly and term goals. I may look into that for next year. I tried it last year and it went well but I did not follow through with that this year (not sure why), but my oldest will be in fifth grade and I think it is time for him to be able to make and achieve some goals. Thanks for checking out my post. Philip is currently finishing up Grade 5. My daughter maybe joining us next year for grade 4. I would use the goals with her as well. This whole year as been a learning experience for everyone on what actually works. I got a lot more particular on curriculum for next year as well.